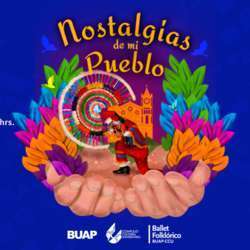 InterNations Puebla February Party - Ballet Folklórico! Nostalgias de mi Pueblo is a show that evokes the nine Magical Towns of the state of Puebla, in a multidisciplinary tour of scenic and multimedia arts, diverse dances, live music and images, which together tell us stories that make us known diverse expressions, wealth and natural treasures from our own entities: Atlixco, Cuetzalan, Chignahuapan, Cholula, Huauchinango, Pahuatlan, Tlatlauquitepec, Xicopetec and Zacatlan. Our consuls Alma and Norma will be helping in hosting this event, please contact them for more information regarding the ticket purchase. After the show, there will be opportunity to have a chat and some drinks and nibbles in one of the restaurants close-by. The guest list will be closed on 16 Feb!